My husband loves Indian food. One of the first times he met me, I was cooking Indian chicken at the dorm kitchen, at college. According to him, he was “just passing by and I just shoved a chicken wing at him as said ‘try this'” He had never had Indian food before!! Coming from an Indian background, I felt that I had eaten so much Indian food, that I must have curry for blood. I never met anyone who had not eaten Indian food before. Well, needless to say, I got him hooked. He couldn’t take spices back then. Fast forward to 12-13 years later, he can out spice me. Return mixture to pot and add heavy cream, bay leaves and 3 tablespoons of butter. Heat remaining 1 tablespoon of butter in a frying pan and brown chicken thighs on both sides. 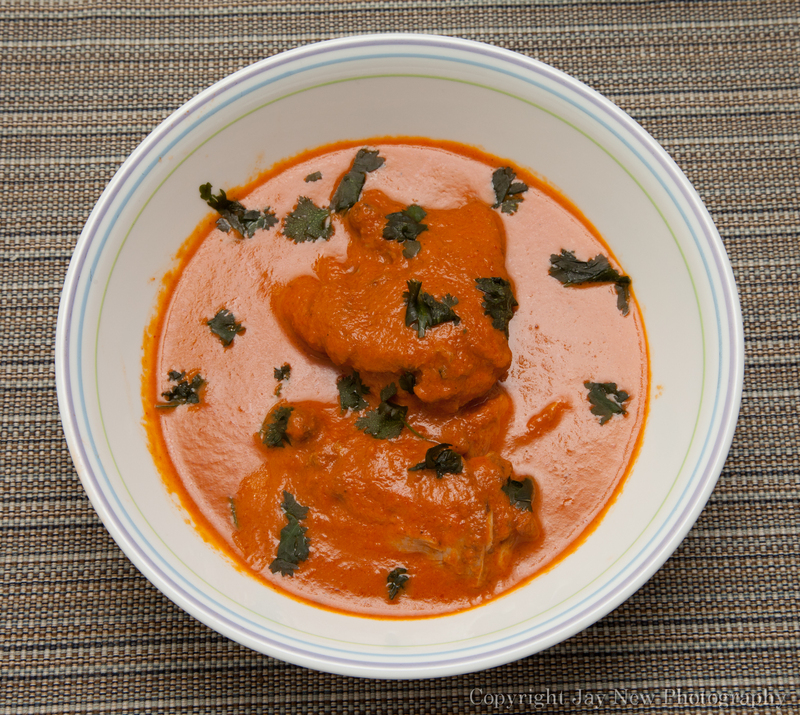 I just tried a butter chicken recipe a couple of weeks ago, and though it tasted nice – it was a bit too plain. Maybe I put in too much cream and not enough spice :S Maybe I’ll give your version a go soon, it looks really flavoursome! Samina, butter chicken and tandoori chicken are my favorite two dishes too. I grew up eating Indian food at friends’ houses… I’ll have to try this sometime because the last butter chicken recipe I tried was terrible. I wish I had a tandoor so I could make proper naan. In fact Hubster and I were set up by a mutual friend and I told her I wouldn’t even consider dating him unless he liked Indian food.. haha. So we went to a local restaurant on our first date and he loved it… it’s also where we celebrate bg milestnes and got engaged! I will say that this was a very good recipe. My family is Indian and I literally grew up eating mostly Indian foods. 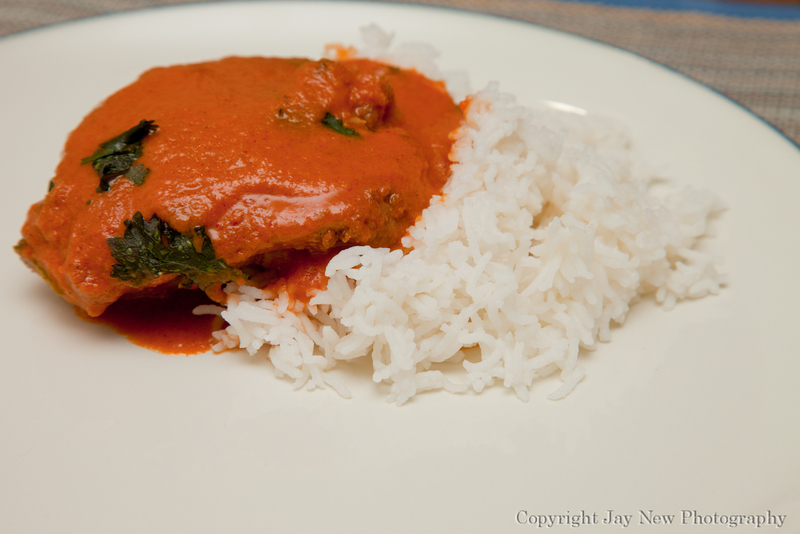 I am extremely picky about Indian restaurants because I compare it to my grandmother’s cooking (which is the best). I wish I had a tandoor as well, but the method I used to make my naan in the oven, did very well. If it is summer time, you can just put the dough on the grill, close the lid and after 2 minutes, flip the naan over, then butter. Tandoors are awesome though…maybe when my husband and I have a house, one day… I hope you make this recipe and you both like it! I grew up vegetarian and have several Hindu friends, I knew their moms would make me food that was completely safe to eat. The man who owns this restaurant grew up in India, one of his parents was Bengali. His wife grew up in a completely different region, so they have a really interested array of dishes. I have seen naan done on the grill, but I wasn’t sure how different turned out. I’m out of garam masala, so I need to order more online. Do you think cayenne pepper would work for the red pepper powder? I’ll link up to you when I get a chance to try this recipe! Red pepper ans cayenne, I have seen used interchangeably. I have a recipe for garam masala which I will find for you. You may have all the ingredients already. Put the cumin, coriander, cardamom, peppercorns, cinnamon, and cloves in a dry heavy skillet over medium-high heat. Toast the spices, stirring occasionally, until they start giving a nice smell. Working in batches if necessary, transfer the mixture to a spice mill or coffee grinder and grind to a powder. Stir in the nutmeg. Store in an airtight container in a cool, dry place. I love this dish and tandoori chicken when I go to restaurants 🙂 Nothing beats my grandmother’s home cooking though!